A view of the White River foreground, and the Wolf Creek gulch, across the river. 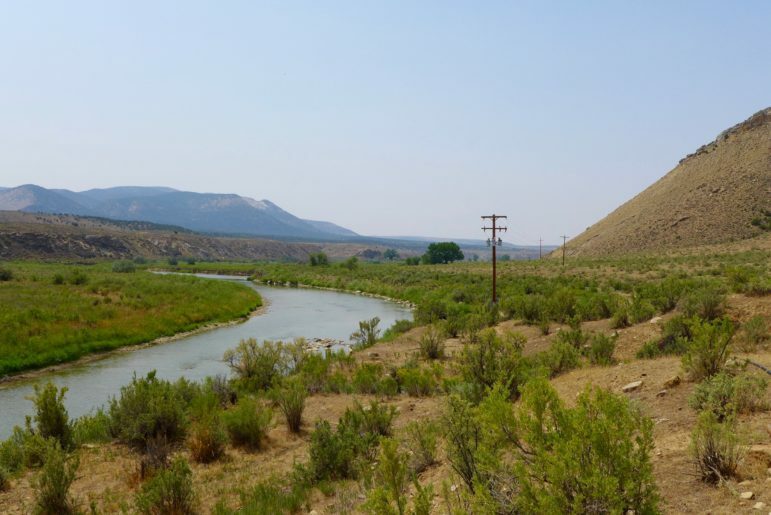 The Rio Blanco Water Conservancy District has been using state funds, and their own, to study two dam options for this area between Meeker and Rangely on the White River. The Colorado Water Conservation Board has given $843,338 to the Rio Blanco Water Conservancy District since 2013 to study a potential dam on the White River, yet officials at the Colorado Division of Water Resources say the project appears “speculative” and Rio Blanco lacks evidence for its claims for municipal, irrigation, energy and environmental uses. On Nov. 14, the CWCB directors approved the most recent grant application from Rio Blanco for $350,000 to keep studying the proposed White River dam and reservoir project near Rangely. But while the CWCB is spending more state money to help prepare the White River project for federal approval, another state agency, the Division of Water Resources, is asking hard questions about the project in water court. “There are concerns whether the district can show that it can and will put the requested water rights to beneficial use within a reasonable period of time and that the requested water rights are not speculative,” wrote Erin Light, the division engineer in Division 6, who oversees the White and Yampa river basins, and Tracy Kosloff, the assistant state engineer in Denver, in a report filed in water court Oct. 4. 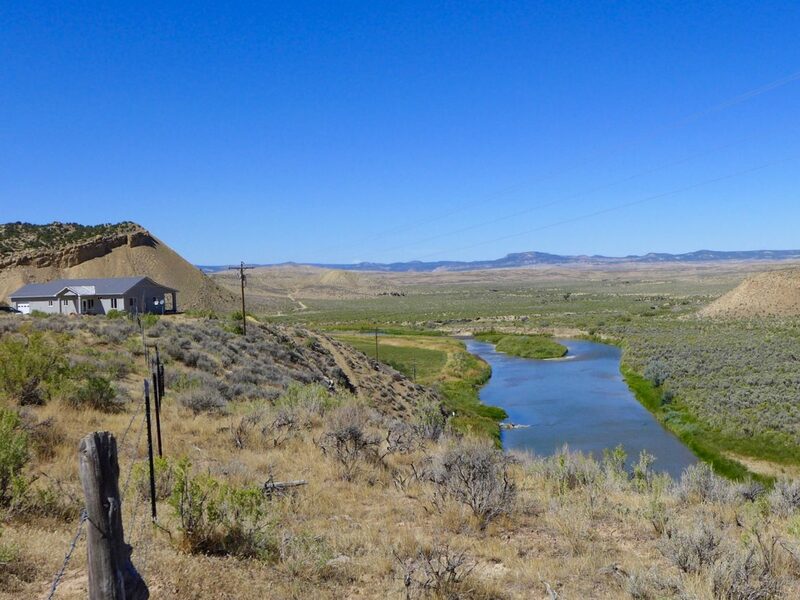 In addition to pursuing a series of grants from CWCB, Rio Blanco applied in water court in 2014 for a new water right to store 90,000 acre-feet of water from the White River. The two engineers in the Division of Water Resources filed their report after consulting with the state attorney general’s office. Review of water rights applications by division engineers is routine, but the report filed by the division engineer and assistant state engineer raised a higher level of concerns than normal. Also known as the Wolf Creek project, it could store anywhere from 44,000 to 2.92 million acre-feet of water, according to the array of proposals, presentations and applications that have been made public over the project’s ongoing evolution. (Please see: Timeline: tracking the proposed White River dam and reservoir). The water would be stored either in a reservoir formed by a dam across the main stem of the White River, or in an off-channel reservoir at the bottom of the Wolf Creek gulch. The latest grant from the CWCB to Rio Blanco was to “finalize the preferred reservoir size and firm-up financial commitments of key project partners so that applications for federal permits can be filed,” according to a CWCB staff memo on the grant. Asked about the apparent conflict between CWCB and DWR on the White River project, CWCB Director Becky Mitchell said she was aware of the concerns voiced by the division and state engineers and was confident that the next phase of study supported by CWCB would help answer some of the questions raised. In another sign of CWCB’s support for the potential project, the agency’s finance section has added a potential $100 million loan to Rio Blanco on a list of potential loans it compiles and publishes as part of the CWCB director’s reports to the agency’s directors. Brad McCloud of EIS Solutions in Grand Junction is serving as Rio Blanco’s project manager for the White River project. A view looking downstream of the White River in the approximate location of the potential White River dam and reservoir. The right edge of the dam, looking downstream, would be against the brown hillside to the right of the photo. In their report filed in water court, the state’s water engineers challenge Rio Blanco oft-stated claim it is seeking the new storage facility at Wolf Creek in order to meet the future water needs of the Town of Rangely, which today takes its water directly from the White River. “While every case is different and may require evidence tailored to the particular facts of the case, the engineers have not received sufficient evidence to support the district’s claimed water demands for Rangely nor evidence that Rangely intends to rely on water storage in one of the Wolf Creek Reservoirs to meet its demand,” the report from Kosloff and Light says. The engineers’ report also questions the demand for water in the potential new reservoir from the energy sector. They said Rio Blanco should, at a minimum, show how much of the 45,800 acre-feet of industrial demand it is claiming is located within the district’s boundaries. They also say Rio Blanco should make public how much of the demand from the energy sector within the district’s boundaries can be satisfied by the existing water rights of the district. In addition to challenging Rio Blanco’s claims for municipal and industrial use of water in their 2018 report, Light and Kosloff also question Rio Blanco’s claims for irrigation and environmental uses. They said a storage report prepared for the project “notes that irrigated acreage and irrigation water demand is projected to decrease in the future” in the area downstream of the reservoir. And the engineers question Rio Blanco claim that it will release up to 42,000 acre-feet of water from its proposed reservoir to the benefit of endangered fish downstream on the White and Green rivers. They say an ongoing study has yet to make clear how much water is needed for the endangered fish. 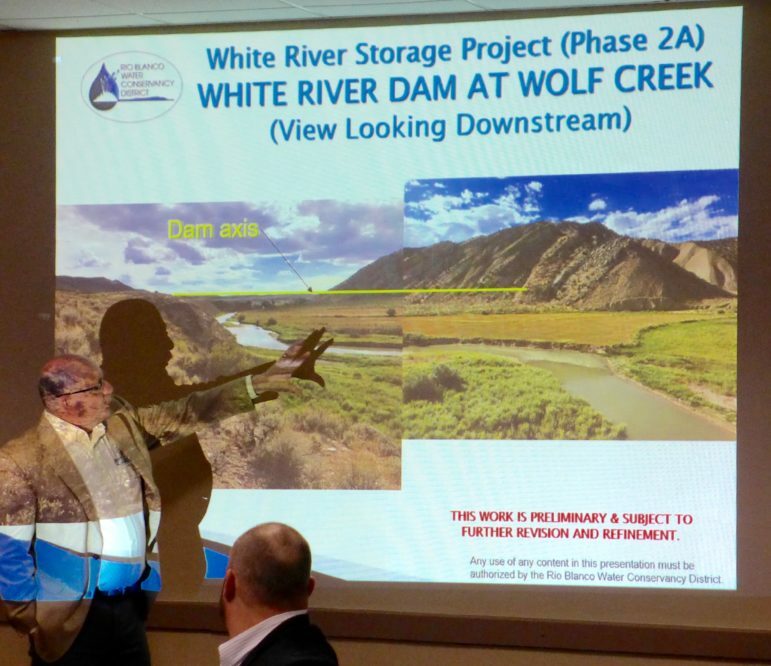 Consultants for the Rio Blanco Water Conservancy presenting a slide earlier this year showing how a dam could be built across the main stem of the White River between Rangely and Meeker. A report from engineers at the Division of Water Resources is questioning the claims made in a water court case in which Rio Blanco is seeking new water rights for the project. The White River project has a wide range of potential uses, according to Rio Blanco, and it also has a wide range of potential sizes, as various presentations and applications have included potential sizes from 44,000 acre-feet to 90,000 acre-feet to 400,000 acre-feet to 2.92 million acre-feet. Alden Vanden Brink, the manager of the Rio Blanco district, told the CWCB directors Nov. 14 that his district is not seeking to build a 400,000 acre-foot reservoir, despite the reference in Rio Blanco’s grant application to study a reservoir between 44,000 acre-feet and 400,000 acre-feet. Vanden Brink said the district was seeking to store “anywhere from 44,000 to about 130,000” acre-feet of water. However, the grant application from Rio Blanco notes that a 400,000 acre-foot reservoir might have some benefit to the state. “If the higher end of the storage is implemented, the project has tremendous potential to help the majority of the state of Colorado address Colorado River Compact administration issues,” the grant said. An earlier study on the dam by W.W. Wheeler and Associates for the Rio Blanco district found it was possible to build a dam on the White River at Wolf Creek that would hold 2.92 million acre-feet of water. Wade Cox, the president of the Rio Blanco Water Conservancy District, discussed the project in October with the board of the Colorado River District, and referenced the varying potential sizes of the reservoir. Editor’s note: Aspen Journalism covers water and rivers in collaboration with The Aspen Times and other Swift Communications newspapers. The Times published the story on Thursday, Nov. 29, 2018.